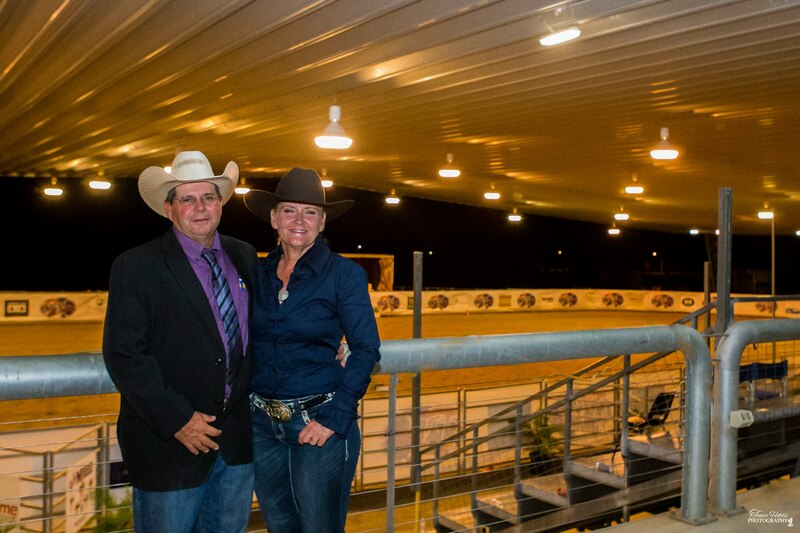 The feature events being the ARBC Dan Kingsley Custom Saddlery OPEN Derby Event where 26 horses were nominated in the six divisions of the Derby running for a total prize purse of $29,049, with the open Derby paying down to 10th Place. The ARBC Dan Kingsley Custom Saddlery OPEN Derby Championship title was taken out by Smart Little Roy ridden by Warren Backhouse and owned by Henry and Julie Maxwell, winning with a top score of 142.5; this is the third year running that Warren has taken out the prestigious ARBC Open Derby Title. 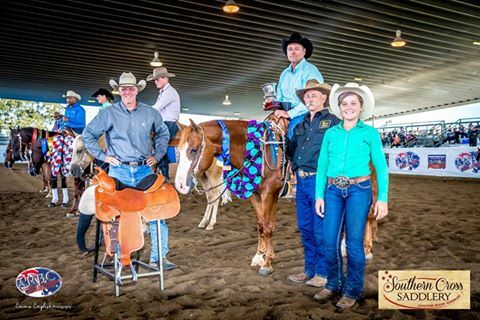 Winning connections also took home $6436.57 along with the Dan Kingsley handcrafted reining saddle, ARBC Trophy Cup, ARBC Buckle and ARBC Show Bridle handcrafted by Mr Rick Meredith, NRHA Lawson Trophy, SPH Saddle Pad along with a garland by Bec Laurie. Nominated Sire owners also receive $1000 to the winning stallion owner PLUS 5% of the placed progeny earnings as part of the ARBC Stallion Nomination Program. The ARBC Nominated Sire of the ARBC OPEN Derby Champion was Doc’s Fancy Roy owned by Errol and Gita Thomas. The Intermediate OPEN Division Champion was Gunnerreload owned by Peter Bartolo, ridden to the win by Rodney Peachey, receiving ARBC Trophy Buckle and Garland by Bec Laurie. The Limited OPEN Division Champion was Seen the Light owned by Cameron Halliwell & Keiran Moses, ridden to the win by Keiran Moses, receiving ARBC Trophy Buckle and Garland by Bec Laurie. The ARBC NON Pro Derby Champion prizes included the ARBC Trophy Cup, ARBC Trophy Buckle and ARBC Show Bridle, hand crafted by Rick Meredith and Garland by Bec Laurie. Our ARBC Marrison Hydraulics Non Pro Derby Champion title was won by Cameron Halliwell riding Gottagetagunner owned by himself and Keiran Moses on a score of 140; congratulations Cameron for taking out this coveted title for the second year running. With three divisions being strongly contested we saw some awesome runs from the Non Pro competitors. Kerri Behrens took out both the Intermediate NON Pro and Limited NON Pro divisions of the ARBC Non Pro Derby riding My Dad’s A Wimp. This year’s ARBC Mark Jackson Electrical Maturity Champion was Warren Backhouse riding Smart Little Roy owned by Henry and Julie Maxwell on a score of 142.5. The ARBC Xtreme Genes Non Pro Maturity Champion was Keiran Moses riding Seen the Light owned by Cameron Halliwell and Keiran on a score of 140. The ARBC Maturity events are for 4 year old horses, running for a prize purse of $4,636 between the two divisions. The ARBC OPEN Derby Event had a total prize pool of $22,987 less the payouts of 5% of the placed horse’s earning to the ARBC Nominated Stallion owners, congratulations to all competitors, owners and connections. Congratulations to all Champions and place getters in all 6 divisions of the ARBC Derby, we thank you all for making the trek to the ARBC and we look forward to welcoming you all back again next year. Thank you to everyone that travelled from as far as Victoria to compete at our show, Mick Taylor, Cameron Halliwell and Keiran Moses. Special congratulations to Cameron Halliwell and Keiran Moses for once again travelling up from Tatura in Victoria and taking home a whopping prize money stash of over $13,500 in cash, not to mention the buckles and prizes you both won as well. Prize money of $13,850 was paid down to 10th place for the ARBC CLASSIC Stockman’s Challenge winners. The ARBC Challenge Events had a total prize pool of $42,400 less the payouts to the ARBC Nominated Stallion owners, congratulations to all challenge competitors, owners and connections. Nathan Wilson once again supporting the ARBC event and coming out as ARBC Classic Champion for the second year running, winning on Lethal N Smart by his ARBC Nominated Stallion Tassa N Smart picking up an extra $1000 on top of his $5,000 winnings plus 5% of his progeny earnings. Another crowd favourite Leah Read stepping up and taking out first and third positions in the OPEN Challenge. Cody Stevens also taking out third place in the Classic Challenge and second place in the OPEN Challenge Event. As we have first go round dry work payouts, congratulations goes to Dave Manchon for taking out first in the Open and first in the Classic Dry Work on Crystal Park Peptos Time taking home $1000 for each of these wins. In the Classic Challenge cattle work we had a tie for first between Nathan Wilson on Lethal N Smart and Jon Templeton on Nonda Wallflower both picking up $750 each for these go round wins. The Open Challenge cow work had a tie for first between Jon Templeton on Nonda Wallflower and Kel Lawrence on Ranch Governess picking up $750 each for these wins. The Rookie Challenge Champion Scott Keogh took out first place on his first trip to the ARBC, this was a hard fought event which saw a lot of new competitors to the ARBC Show. This year we introduced the ARBC OPEN and NOVICE Campdraft Events and we saw some competitive and skilful Campdrafters competing for the prize pool payout of $3,600 plus ARBC buckles and prizes. Big congratulations to Darrin Jones taking out first position in the OPEN Draft and Jon Templeton for taking out first position in the NOVICE Draft. Great work from Hayley Ahern for taking out third place in both the OPEN and NOVICE Draft on different horses. It was to have the draft event this year and we look to expanding on draft events for our 2019 ARBC draft events. This was a hard fought even with Leah Read once again showing high scores in both the dry work and cattle work. With the girls taking out the first two positions in this feature event, with Dave Manchon rounding up top 3, congratulations to all competitors this was one exciting event. These cattle events would not have been made possible without the supply of great cattle from Ian Stark and Jeanne Seifert from Seifert Belmont Reds and Trevor and Katrina Maunder the cattle were exceptional helping add to the strong competition in all our ARBC cattle events. Thank you also to Jason Gates from RPC Livestock Haulage for getting our cattle delivered to and from our ARBC Show. The ARBC saw the introduction of the ARBC Western Dressage Events held on Sunday 25th March with a full day of competitions held. We would like to thank Western Dressage Association of Queensland organisers Jim Whitaker, Vivian Wearing, Lisa Berg, our judge Steve Thake and his penciler/wife Anne from Western Dressage Queensland for making this event possible. A special thank you goes out to all the callers for the riders including Louise Harris. Such a great number of entries for our first ARBC Western Dressage Event held on Sunday 25th March. A total of 11 classes were run with over 38 tests completed at this great event. Congratulations to everyone and thank you for helping to make it such a successful event at our ARBC Western Dressage Event Thank you to Jim Whitaker, Vivian Wearing, Lisa Berg, our judge Steve Thake and his penciler/wife Anne from Western Dressage Queensland for making this event possible.